Aakhree Raasta (English: The Last Option) is a 1986 Bollywood film starring Amitabh Bachchan in a dual role, Sridevi, Anupam Kher and Jayaprada. It was directed by the famous Tamil actor and director Bhagyaraj. It is a remake of the 1984 Tamil film Oru Kaidhiyin Diary (English: A Prisoner’s Diary) starring Kamal Haasan; Kamal Haasan also played a dual role in the original movie. The film opened to packed houses in 1986 and turned out to be a roaring blockbuster hit. It was Amitabh Bachchan’s last hit before his gloomy period had started. Critics had mixed reviews about the box office collections but it was declared a super-hit. Amitabh’s double role fetched him much needed hit. Playing father and son pitted against each other was already a cake-walk for this legendary actor and he’d played with much ease. Picturized mainly in Chennai(then Madras) and Ooty, the film had a beautiful line up of superstars like Jayaprada, Sridevi, Anupam Kher, Sadashiv Amrapurkar, Dalip Tahil and Bharat Kapoor. This was Sridevi’s second film with the mighty Bachchan. However, their romantic track did not go too well with the script as the script was too serious to cater to romance. 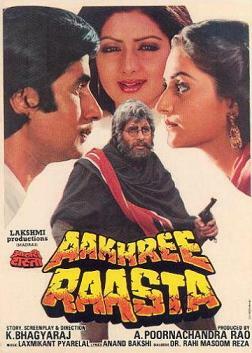 The highlights of the movie have been Amitabh’s both character’s confrontation scenes. Aakhri Raasta is still considered as Bachchan’s finest works to date.